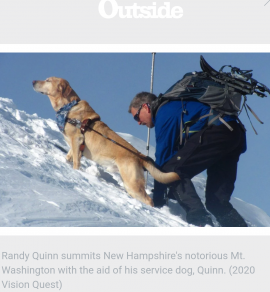 Today’s guest post from Wes Siler for Outside’s Indefinitely Wild blog, makes a similar appeal to fakers who put people with real disabilities at risk. Loving your pet too much is putting people with real disabilities at risk. It’s time to stop falsely claiming that your dog is a service animal and to stop bringing pets into restaurants, onto planes, and to other places where only service dogs are permitted. Data backs my anecdote up. A study conducted at the University of California at Davis found that the number of “therapy dogs” or “emotional support animals” registered by animal control facilities in the state increased 1,000 percent between 2002 and 2012. In 2014, a supposed service dog caused a U.S. Airways flight to make an emergency landing after repeatedly defecating in the aisle. A Google News search for “fake service dog” returns more than 2.2 million results. This has recently led state governments to try and curb the problem through law. In Massachusetts, a House bill seeks to apply a $500 fine to pet owners who even falsely imply that their animal may be a service dog. In California, the penalty is $1,000 and up to six months in jail. Twelve states now have laws criminalizing the misrepresentation of a pet as a service animal. That’s good, but with all the confusion surrounding what a service dog actually is, there’s less and less protection for their unique status. A new bill introduced to the Senate this summer by Wisconsin Democrat Tammy Baldwin threatens to add to the confusion even more. If it becomes law, you’ll be able to take any animal on a plane simply by telling the airline that it’s an ESA. Alarmingly, the bill seems to include ESAs in its definition of service animals. Look, I get the desire to bring your pet along with you everywhere you go. My dogs are as important to me as my friends and family. The first criteria my girlfriend and I apply to where we eat, drink, and travel is whether our dogs can enjoy it with us. But out of respect for the needs of disabled people, for the incredible work that real service dogs perform, and for the people managing and patronizing these businesses, we will not lie. We do not take our pets places where they’re not welcome. We never want to compromise the ability of a service dog to perform its essential duties. As an animal lover, don’t you want the same thing? That same law makes no requirements or provisions for any registration, licensing, or documentation of service animals. It also prohibits businesses or individuals from asking a disabled person for proof that their dog is a service animal. In fact, the ADA permits only two questions to be asked of people with service animals: Is the dog a service animal required because of a disability? What task is the dog trained to perform? That’s it. No inquiry can be made about the nature of the disability and no proof can be requested, nor are there any licenses or documents to prove a dog is a service animal. Emotional support animals (let’s just use that as a catchall for any dog that provides comfort but does not perform a specific task) are specifically excluded by the ADA, and access for them is not provided by that law. Businesses and similar entities are left to define their own policies. Amtrak, for instance, does not consider ESAs to be service animals and does not permit them to ride in passenger areas on its trains. Because ESAs provide benefit by their mere presence, there’s no burden of training for them like there is for a service dog. The presence of untrained, or poorly trained dogs in public places, and on crowded airplanes can lead to significant problems. In June, an ESA aboard an airplane attacked the human seated next to it, resulting in severe injury. So where’s the confusion come from, and why are there so many pets on airplanes these days? The Air Carrier Access Act (ACAA) does recognize ESAs and mandates that they be allowed on planes. It also goes further to place a burden of proof on owners of both service animals and ESAs. Pierce’s dog, Autumn, completely ignores other dogs, doesn’t beg for food, sits quietly for the duration of long flights, and generally minimizes her impact. That’s the result of lots of money—service dogs cost upwards of $20,000—and thousands of hours of training. Pierce, for example, has developed a routine with Autumn that involves the dog communicating when she needs to go to the bathroom, and then doing so in a specific orientation to Pierce that enables him to easily find it and collect it in a baggie. A true service dog is essential to its human partner’s well being, as well as a huge financial investment that other untrained dogs in public places put at risk. The increasing presence of ESAs on flights, and in businesses has also combined with confusion around the law to create a backlash that’s impacting true service dogs, in addition to pets. “On that flight, I overheard the flight attendant remark to her colleague that she wished they wouldn’t allow service dogs,” describes Pierce. His disability is obvious, but that’s not always the case for people who need service dogs, and those with disabilities already find going out in public difficult and intimidating. Fake service dogs are giving real ones a bad reputation. You can order service dog vests, tags, harnesses and other paraphernalia on Amazon and countless other websites. Dozens of websites and services claim to offer registry, certification, licenses, or other documentation for service dogs—all scams, as the ADA neither defines or requires any such proof. To take your emotional support animal on an airplane, all you need is a letter from a licensed mental health professional that’s on letterhead, signed, and less than a year old. You can buy those online for a few bucks: news investigations have found psychologists offering to sell them to otherwise undiagnosed clients. Heck, most of us could probably counterfeit one using Photoshop. Pierce is frustrated that the law is so vague, often misunderstood, and simply used as an excuse to bring pets somewhere they don’t belong. Because you can only ask if a person with a service dog has a disability and what tasks the dog is trained to perform, most businesses and other services simply don’t question service dogs at all. And most people with emotional support animals don’t realize that their pets aren’t actually guaranteed equal access by the ADA, or any other law, outside of air travel. We find ourselves in a society that requires you to present a diagnosis of mental illness (or soon, just a verbal claim of such) if you want to safely fly with your dog. The system is broken. In 2014, 25,000 emotional support animals boarded Jet Blue flights alone. Why isn’t there an airline that offers safe transport for pets? Or specific pet-friendly flights on certain popular routes? And why aren’t there more dog-friendly restaurants, bars, music venues, and other businesses? There are nearly 90 million pet dogs in this country. That’s a huge market, but also a huge problem when us owners act inappropriately. As animal lovers, creating and supporting dog-friendly businesses should be our priority. Acting selfishly to the detriment of others will not create a more dog-friendly future. We want to be able to take our dogs to more places, more often, but we have to make sure doing so is appropriate and doesn’t infringe on the rights and well-being of people who need real service dogs. The American Kennel Club offers a Canine Good Citizen certification after a formal process of testing and training good behavior. If you want to bring your dog into a café, why aren’t you being asked to produce evidence of that, rather than falsely stating that the business owner has to permit your emotional support animal? Wes Siler runs IndefinitelyWild, Outside’s lifestyle column telling the story of adventure-travel in the outdoors, the vehicles and gear that get us there, and the people we meet along the way. You may recognize Wes from such websites as Jalopnik, Gizmodo, and Hell For Leather, where he used to review cars and motorcycles, and share his various misadventures, outdoors and otherwise. Wes lives in LA with his dog, Wiley. IndefinitelyWild is an outdoors lifestyle blog on @outsidemagazine brought to you by @wessiler and friends.